For solo paddling I remove the front seat & slide the rear seat fully forward to mid-ship. Aqua Bound Paddle..MantaRay 230cm long/aluminum shaft & 2piece with adjustable feather. I use a milk crate behind my seat that has 2 PVC pipes attached for rod holders. I use a plastic covered Barbell for an anchor. Once yak, ya never look back! for a second i thought it was lew with a kayak. 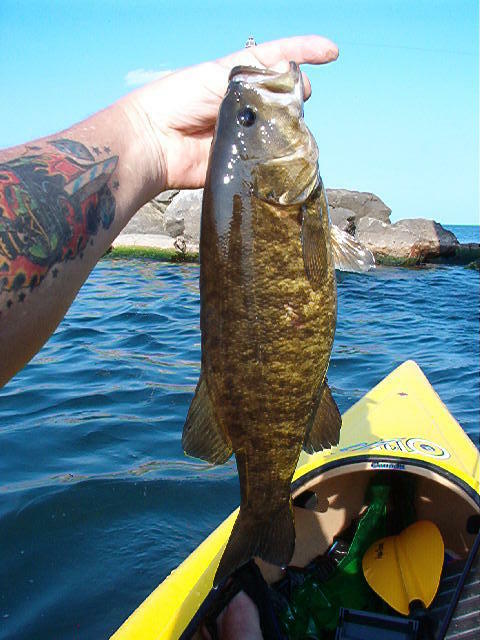 Right on Dan nice smallie, I am contemplating on getting one for next summer i seen a couple that caught my eye that have waterproof storage. HOKEY SMOKES BULLWINKLE!!!... I think hell just froze over!!! Nice report and pic Dan'l!!! That's a pretty sweet lookin Smallie too!!! You're in the know, danbo . Who needs an operators card? We don't need no stinking operators cards . Yeah Baby! It's the only way to fly!